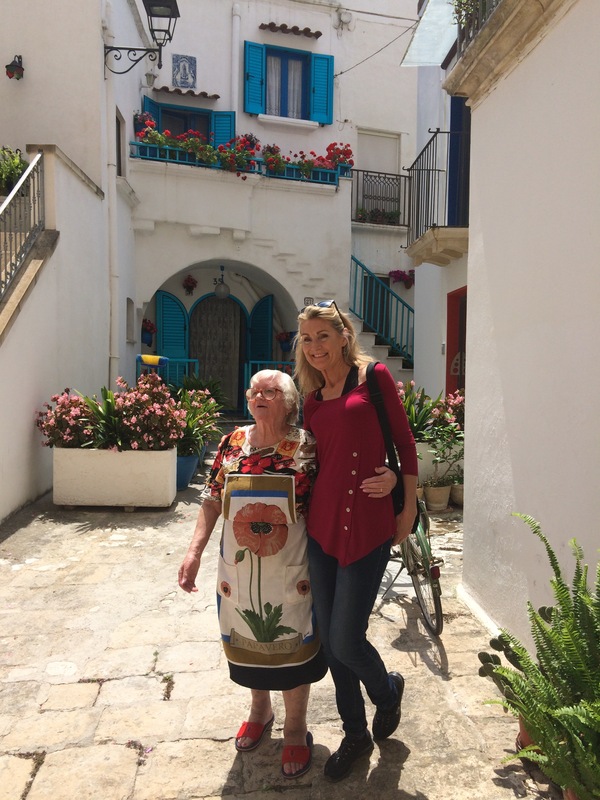 One of my very favorite things to see in the little villages of Puglia are the tenderly cared for porches and courtyards of the local residents. Freshly swept and colorful, they speak volumes about the people who live there. In the photo above, a lush garden cultivated in pots line the stairways and add a sense of privacy to seating areas. The welcoming effect always causes me to stop as I’m passing by and observe. It’s not unusual for the lady of the house to come out and greet me with a warm smile and a hug. She is as tidy and impeccably dressed as her little courtyard. She is proud of her home and I heartily express my enthusiasm for her lovely garden. Isn’t this lady of the house lovely? We couldn’t communicate much but I felt the love through her warm smile and sweet countenance. I’ve since tucked this away as one of my fondest memories. Isn’t that wonderful? I love this aspect about the elderly in Italy. How beautiful – you’ve inspired me on how to do a courtyard at home. the unexpected memories are so often the best. Susan! What an inviting post – I can just about picture myself there in the courtyard. Puglia is on our list and hope to spend time there next year! I just love your posts – as if you’re speaking to us! Thank you Deborah. 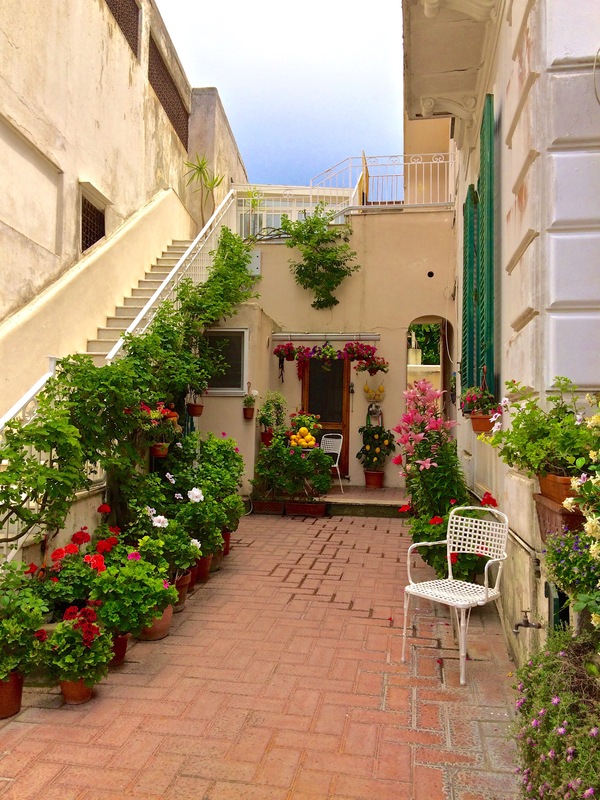 I know you would love Puglia…the whitewashed villages are so intriguing, and the potted gardens are such a beautiful sight to behold. My pleasure! Thank you for sharing your memories of the courtyards in Crete. I have been there and I know what you are talking about. Absolutely lovely. Dear Susan, what a lovely courtyard, lovely flowers and lovely picture of you two. 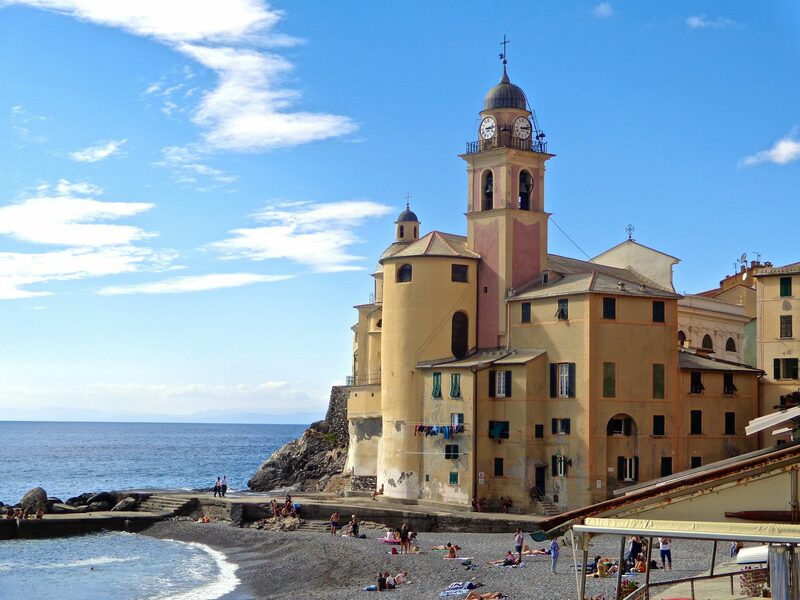 Your posts about Italy reveal so many wonderful neighborhoods to visit and view. I could spend all day touring courtyards and gardens. True! And have you been to Alberobello? Amazing town! So very sweet. Love that photo with you and La Signora. My similar experience was also in Puglia, when I visited a school where my cousin taught. We were greeted by the very elderly nun/headmistress who was tiny, thin, but so spunky, loving and welcoming. It is a beautiful memory. Thank you for the post! Thank you! Always my pleasure…and I’m glad you have a wonderful memory of your own. That is also what I love Susan. And, i love that first photo. Picture perfect. Very inviting! Looking forward to a trip to Puglia in October. So exciting. Have a wonderful time.